Some days, the information flow coming through email distribution lists is just overwhelming. A number of us have been experimenting with a different approach to receiving those emails, a so-called “digest” that we receive at 5pm (4pm in the winter) of all the emails of the previous 24 hours. The format of the digest is a hyperlinked table of contents, followed by summaries of the messages (and links to read more of longer messages). If this is an appealing format for a distribution list, directions are below. You may want to think carefully about both which distribution lists you want in digest form (hint: you might only want one! ), as well as thinking about any potential caveats (including how you might check for an important message before the digest arrives!). Which distribution list should I “digest”? The distribution lists are actually “nested” inside each other. For example, DL-Faculty is one of the subscribers to DL-FacStaff, which is, itself, a subscriber to the DL-AllSchool list. What does this mean? It means that you receive the DL-AllSchool messages through DL-Faculty… so if you turn on the digest for DL-Faculty, it will collect all of the messages for all three lists in one place (since you receive all those messages because you are personally subscribed to DL-Faculty). Conversely, if you wanted to receive only the digest for DL-AllSchool, you could set that up… and then receive DL-FacStaff and DL-Faculty as individual messages. In general, the most aggressive “digesting” approach is to turn on the digest for the group that you most specifically belong to. What if I want to check for a message before the digest is sent out? …and you will have a lovely browsable, searchable view of all messages sent to that distribution list group. Are there any downsides to receiving a digest? Reasonable people disagree about the benefits of the digest view — and some quite passionately. In short, the biggest issue is that sometimes important emails for the next day get sent after 5pm. From personal experience, this has happened twice in one week, but that was the only week of the year when it happened. One imagines that, if enough people received these email group messages as digests, those post-5pm emails might get handled differently (either by reconfiguring distribution list structures or personal habits), however, for now this continues to be experimental. How do I set the digest up (or turn it off)? 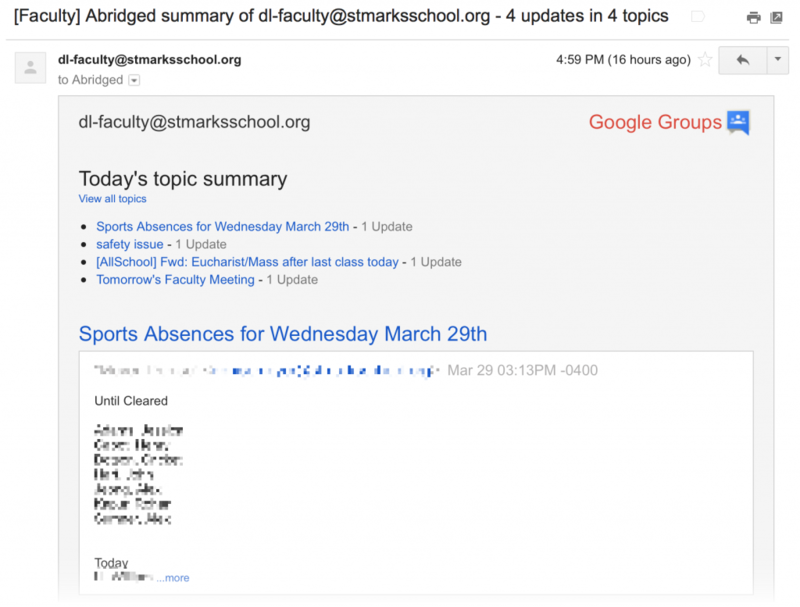 Point your browser to the St. Mark’s Google Groups and visit My Groups. Pick the group that you want to “digest”. Under the “My Settings” icon in the top-right, choose “Membership and Email Settings”. This entry was posted in Faculty and tagged Gmail, email, Google Groups, Reviewed by Academic Technology 2016-2017, digest, distribution list.